Pets On Board Helping Animals Online Since 1995! A man in Luzerne County, PA has an unusual visitor in his backyard pool. Dominic Lombardi tells us a bear has broken his fence and swims in his pool in Hanover Township, near Nanticoke. And the bear must enjoy his visit here because the homeowner tell us this the bear went swimming three times during his visit Thurday. 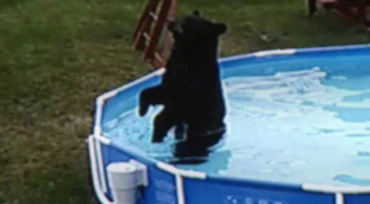 Watch the video here: via A Bear in a Swimming Pool? A Bear in a Swimming Pool! | WNEP.com.